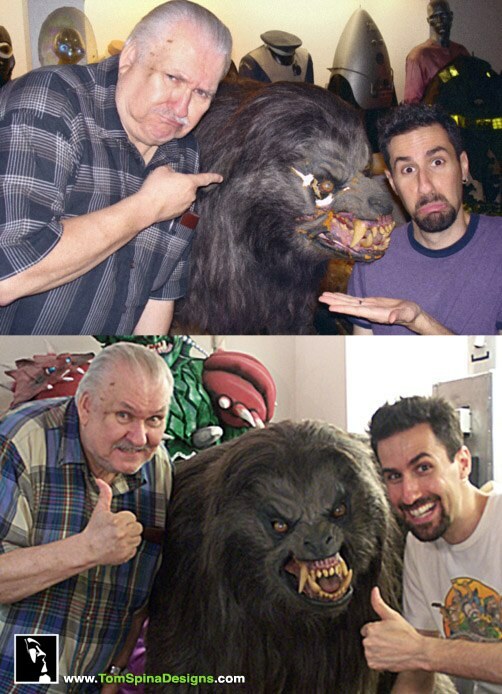 Restoring the original Rick Baker American Werewolf for our friends Bob and Kathy Burns! 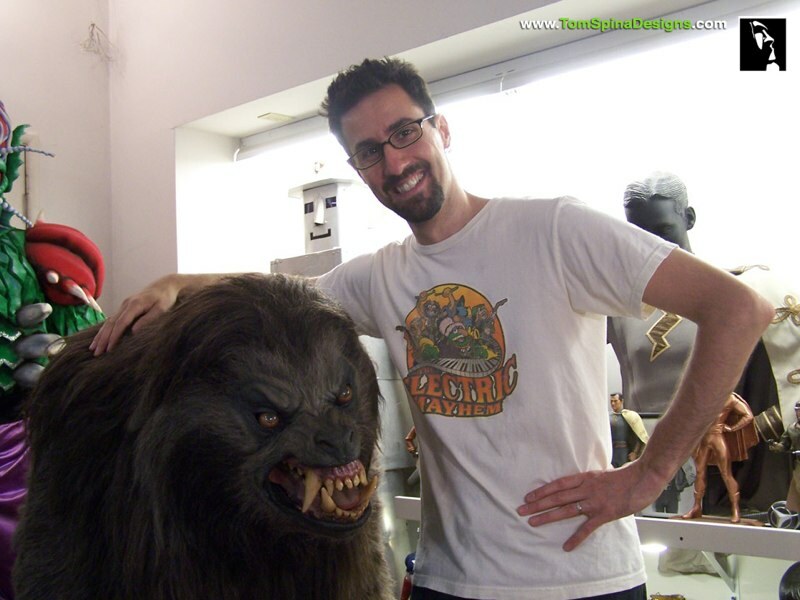 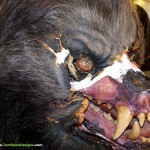 We were very honored to be asked to restore the original Rick Baker American Werewolf prop/costume. 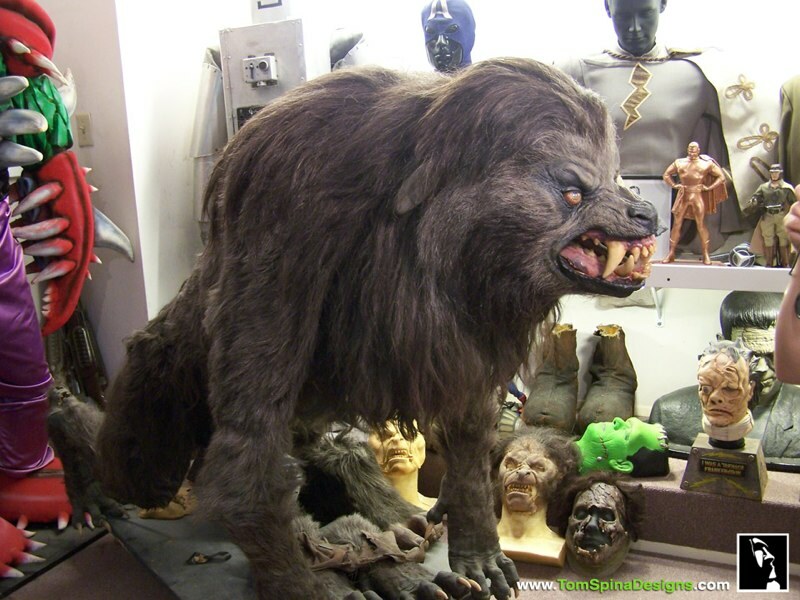 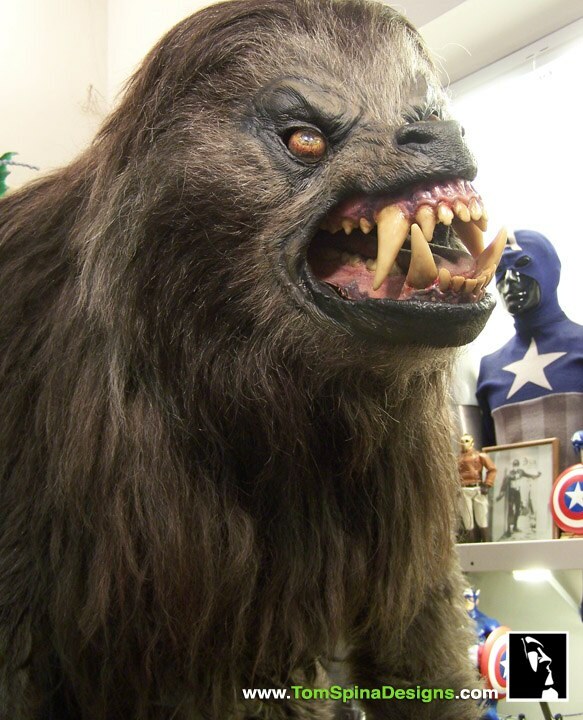 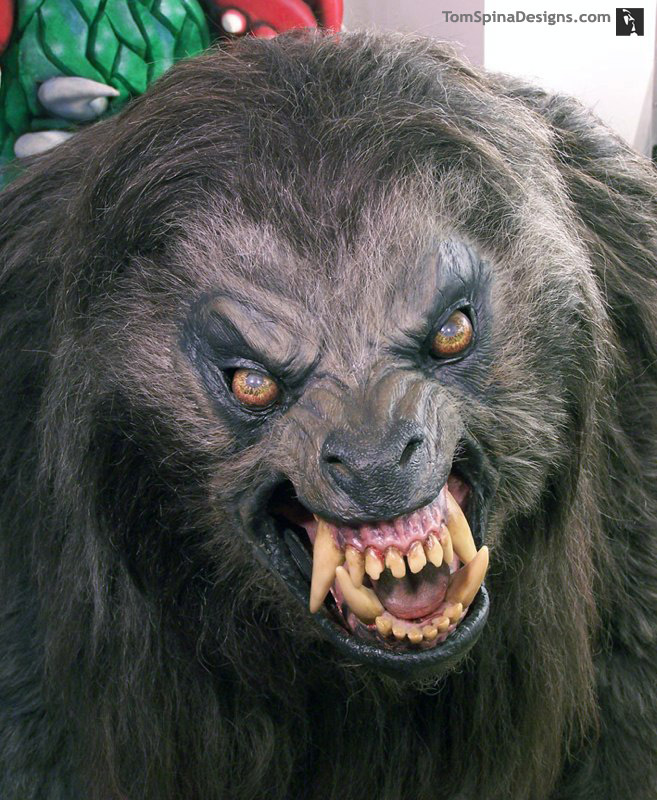 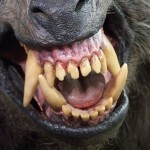 Created by Rick Baker and his team of special effects artists, the life sized wolf seen in An American Werewolf in London was realized as part costume, part puppet and part wheelbarrow! 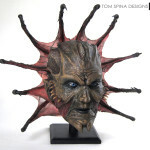 Be sure to check out the DVD special features for more on this and all of the incredible props produced by Baker’s crew. 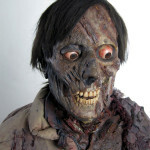 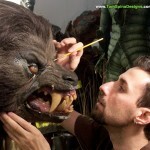 For that work, Baker received the first-ever Academy Award for Best Makeup (it would prove to be the first of many for the talented young effects artist). 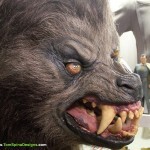 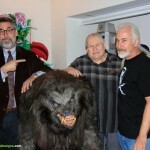 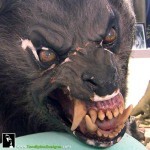 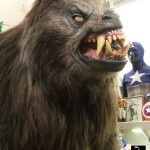 Eventually, Baker presented the original foam latex prop wolf to his long-time friend, collector Bob Burns, who proudly displayed the piece alongside his other historic sci-fi and horror movie props and costumes. 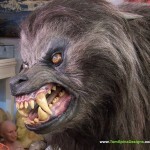 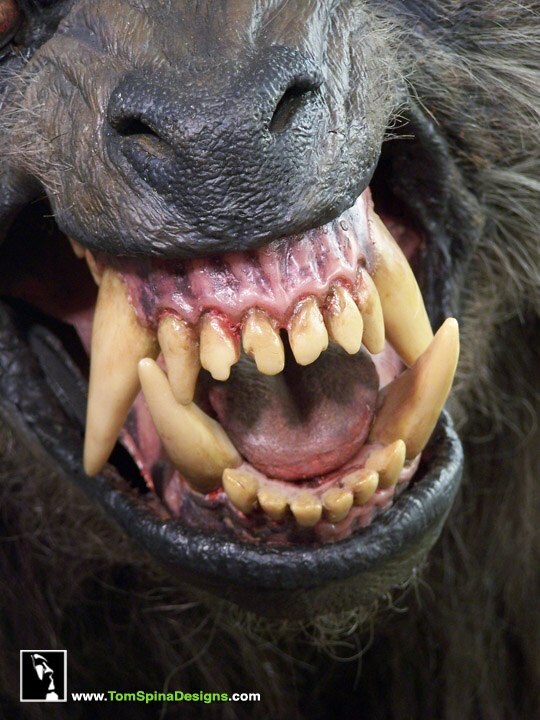 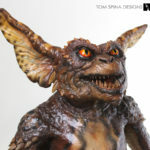 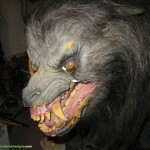 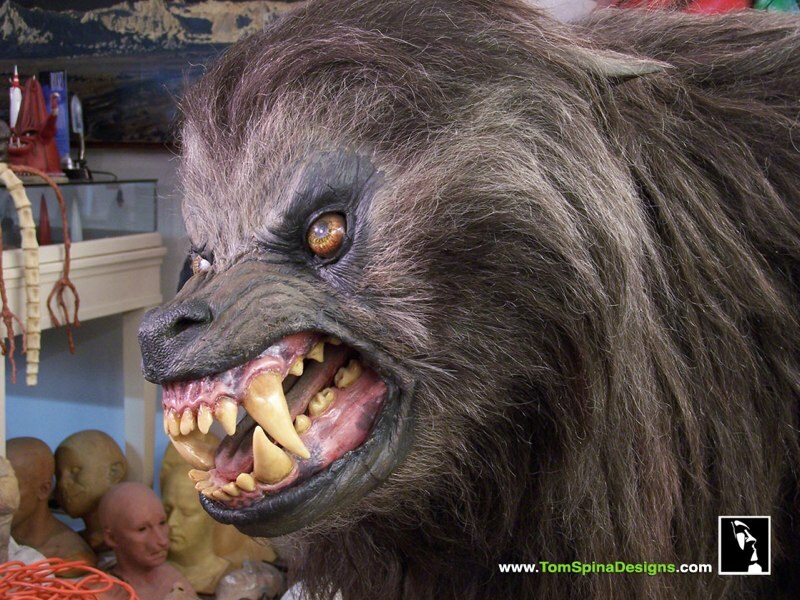 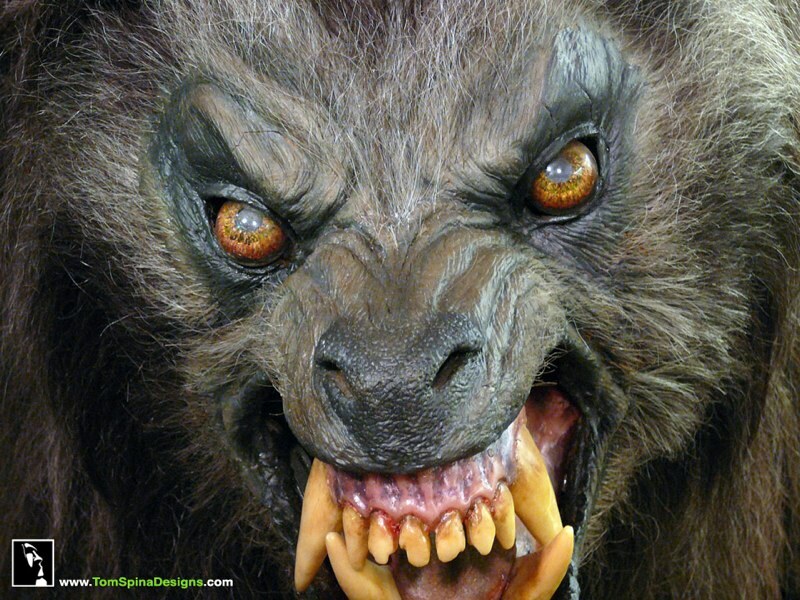 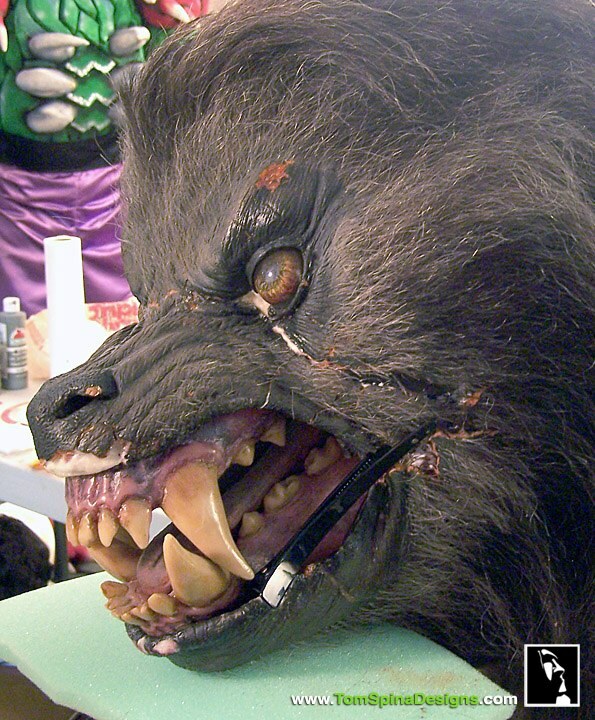 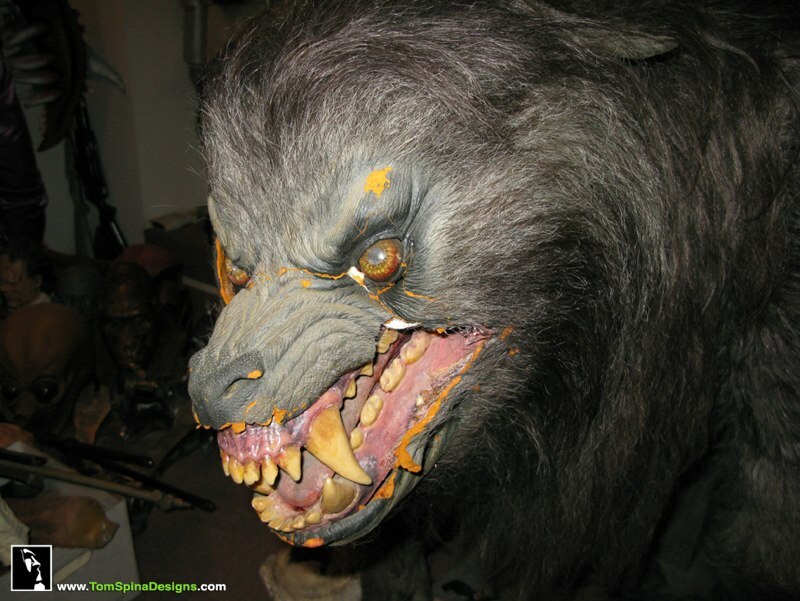 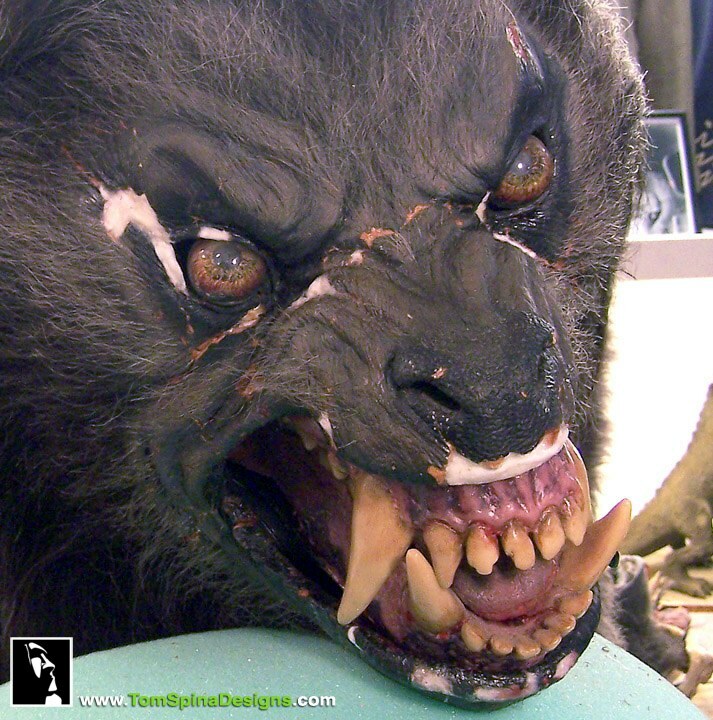 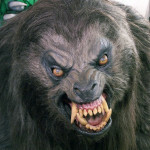 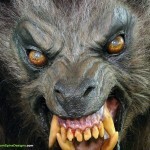 As of 2008 “Oscar” (a name given to the wolf by Bob, to acknowledge Rick Baker’s win of the first ever Best Makeup Oscar for his work on the film) was a nearly 30 year old foam latex movie prop, and as too often happens, age and handling had taken their toll. 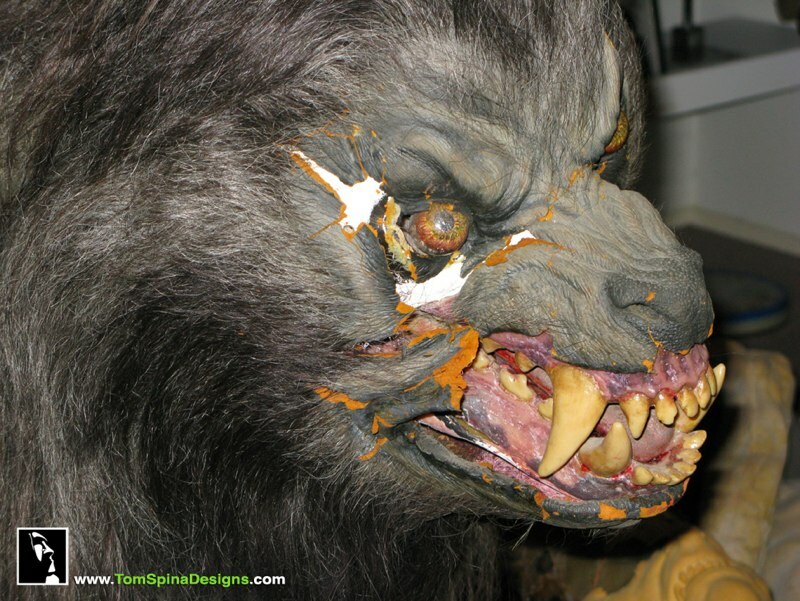 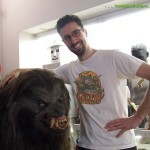 In hope of preserving this important movie artifact, Bob, contacted his friend Tom to discuss “Oscar’s” condition and a possible restoration of the Rick Baker American Werewolf. 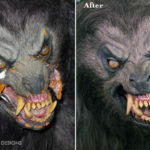 Due to the size and fragile nature of the prop, it was determined that an on-site restoration would be the best approach. 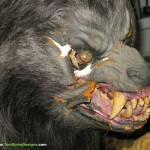 When we arrived, “Oscar’s” condition was poor. 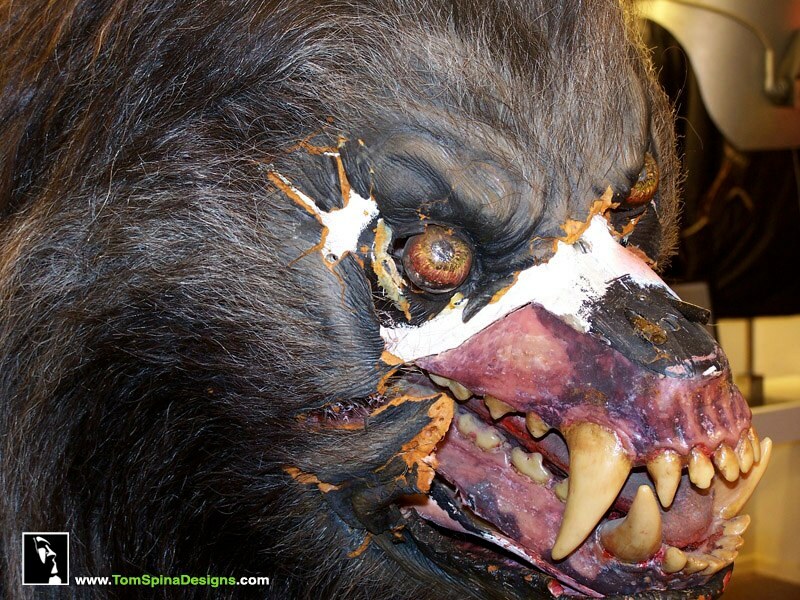 The foam was dry and brittle. 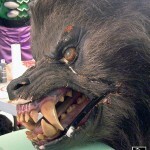 Large sections of the wolf prop’s foam latex cheeks, lips and eyelids had crumbled to dust and other pieces hung on by a thread. 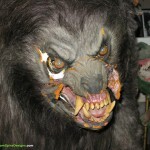 To further complicate things, some of the areas in need were covered in hand-punched fur. 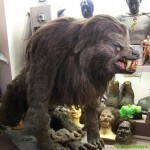 Extremely fragile areas were strengthened and pieces were painstakingly affixed in place, much like assembling a puzzle. 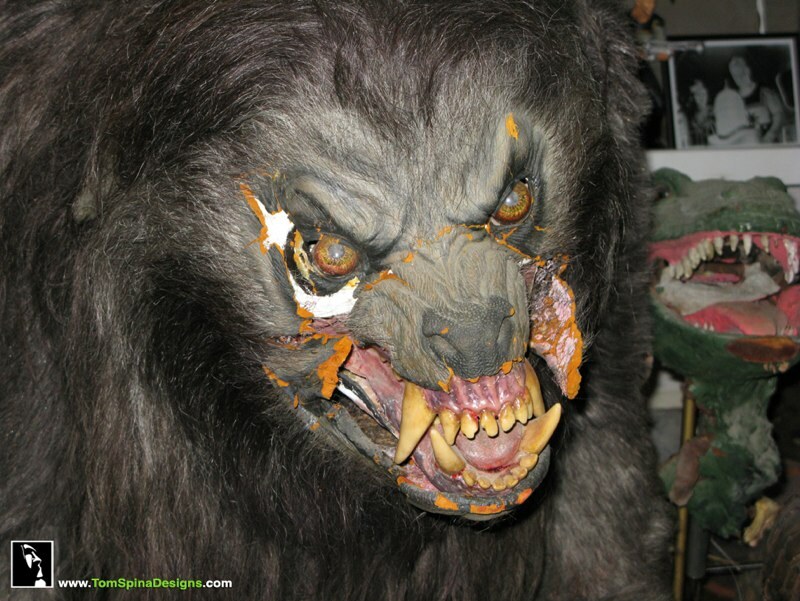 Cracks were filled and blended where possible and the remaining gaps and missing details were then rebuilt and sculpted to match the surrounding textures. 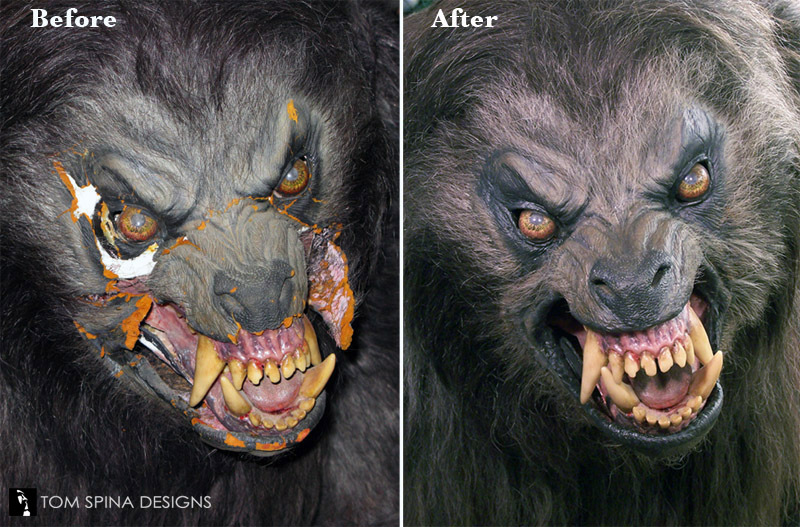 Paint was only applied to the repaired areas and colors were carefully blended to match the original, aged paint. 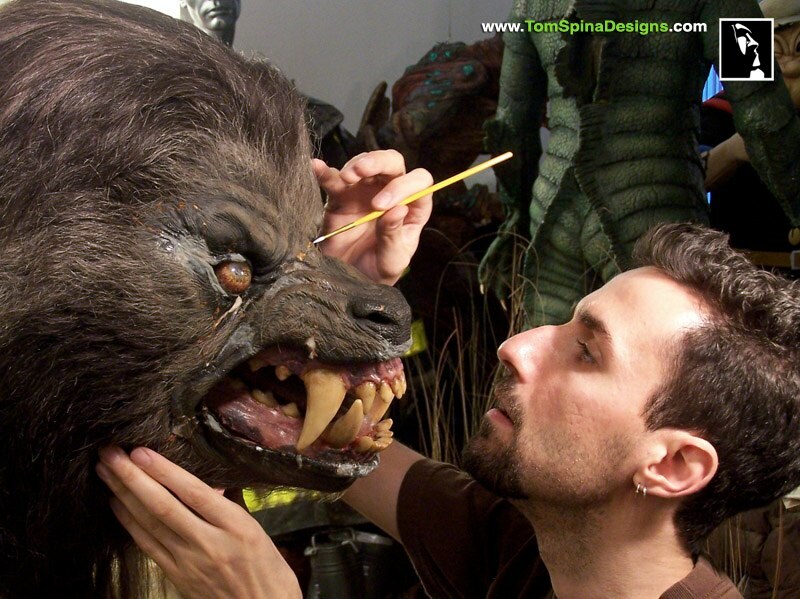 Several large areas that had once been covered in fur were rebuilt and painted so that hair (which was “borrowed” from other areas of the wolf) could be carefully applied and blended into the original hair work. 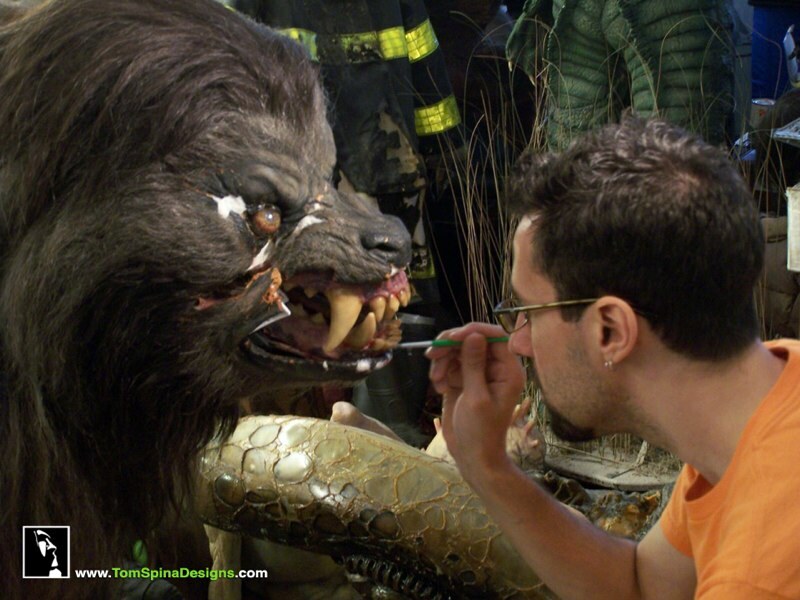 Throughout the process, efforts were made keep the piece as original as possible and, most importantly, to make all of the areas that were repaired visually consistent with the age of the prop. 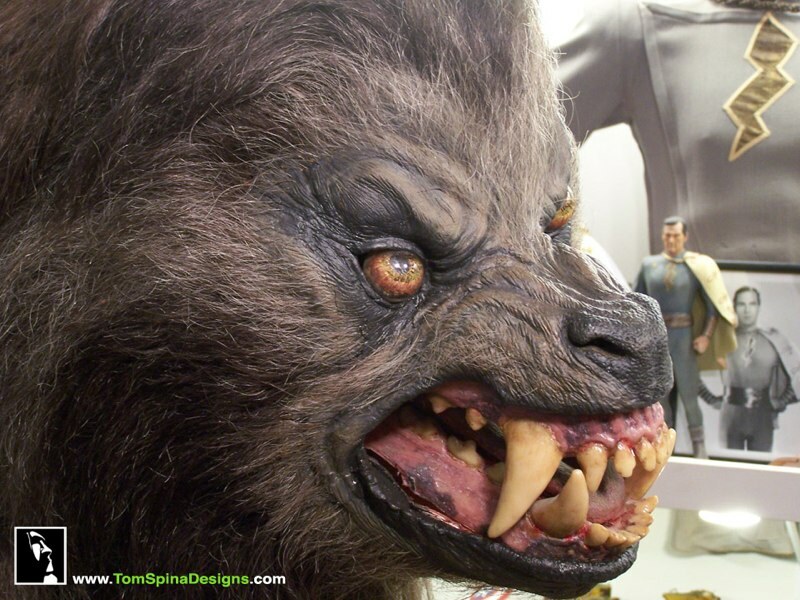 The goal was not a result that looks “brand new” (the way a replica head might) but a piece of movie history brought gently back to life… something that now looks “great for its age” while maintaining the integrity of the original work and preserving the “feel” of the character. 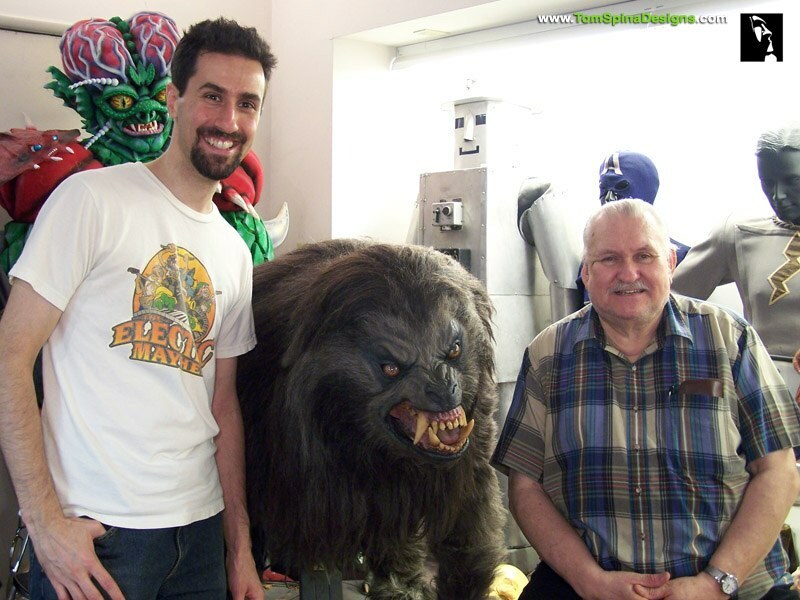 Bob and Kathy Burns for their hospitality during the work. 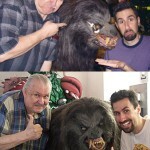 John Ciarlone for years of friendship and for playing host during my stay. 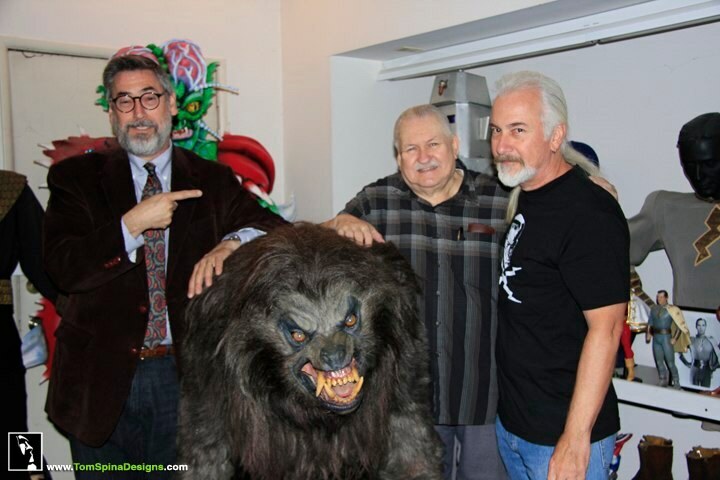 Kelly, for his assistance & photography, and of course, to Rick Baker for igniting the imaginations of artists & filmgoers everywhere with his brilliant work! 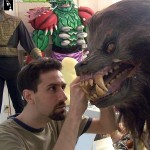 Check out this video about our restoration!